With most depictions of a delicate garter tied around a young woman's thigh it is hardly surprising that most people associate the garters with female dress. Until around the 16th century, however, it was also used by men in ceremonial dresses. 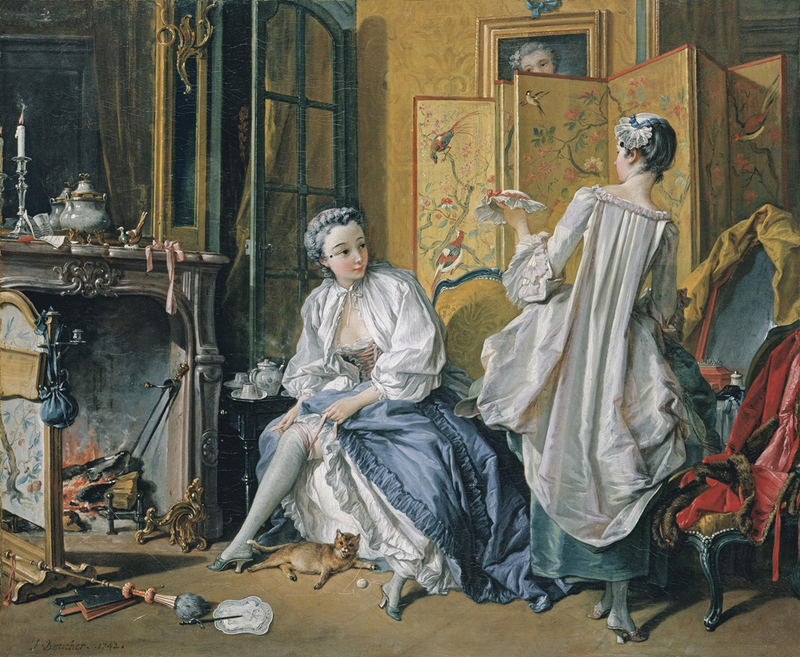 As this blog focuses on the 17th and 18th century I will restrict myself to the female ones from this period. 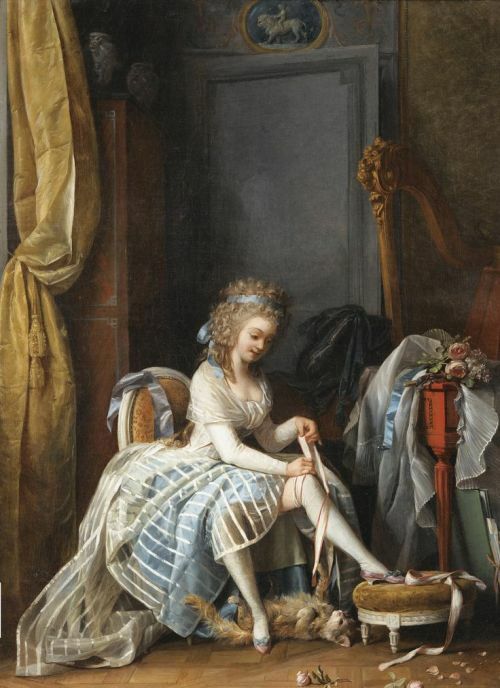 Garters were ribbons of fabric which were worn either above or below the knee. For the upper classes they were made from expensive materials such as silk. 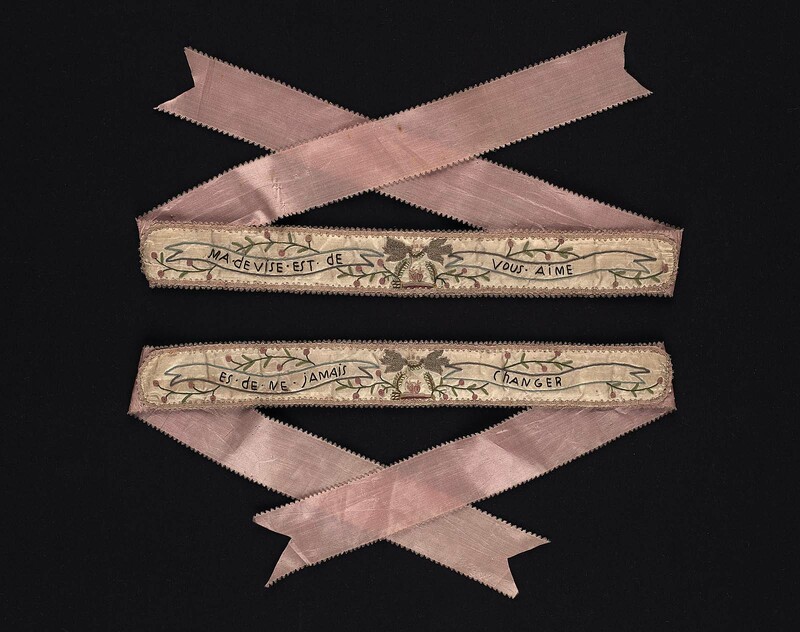 These garters would often be richly decorated with embroideries of ornate patterns or personal mottos. Unlike the male counterpart, ladies' garters were not visible to the naked eye; men had worn them on their hoses while ladies' hid them underneath a full body of skirts. Their main function - other than as a fashion statement - was to hold up the stockings. They could either be fastened with buckles or laces; the latter seems to be a more comfortable choice, though. As most fashions this could have a dark side as well. Some women tightened their garters so tightly that their blood circulation suffered as a result. To avoid any chafing garters were often padded. 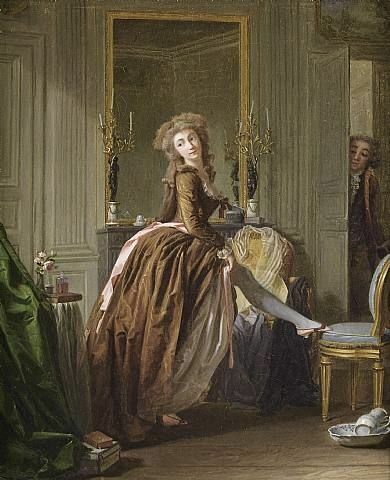 One peculiar episode concerning garters involved the Sun King's mistress, Marie-Angélique de Fontagnes. Her signature hairstyle - naturally named after her - came to be when she found her hair disheveled while out hunting and bound it up using her garters. Usually, garters were white but could be extensively decorated. As an example the purchase of the Duchesse d'Orléans from 1737 illustrates this. She bought seven pairs of garters; one was embroidered with green and gold, another with silver. Yet another consisted itself of silver cloth while a fourth pair was embroidered with silver in four colours. As can be deduced from this order garters were worn on both legs - to keep both stockings up. The rather newer trend of having a single wedding garter is of a more symbolic nature. Legend has it that Marie Antoinette's remains were identified by the characteristic Habsburg-jaw as well as a monogrammed garter. Naturally, since the garter was a part of a lady's delicates they were not shown on official portraits. However, thanks to the wonderful art of the 18th century we are left with some beautiful examples nonetheless.